An attack is an offensive operation that destroys or defeats enemy forces, seizes and secures terrain, or both. Movement, supported by fires, characterizes the conduct of an attack. However, based on his analysis of the factors of METT-TC, the commander may decide to conduct an attack using only fires. An attack differs from a MTC because enemy main body dispositions are at least partially known, which allows the commander to achieve greater synchronization. This enables him to mass the effects of the attacking force’s combat power more effectively in an attack than in a MTC. 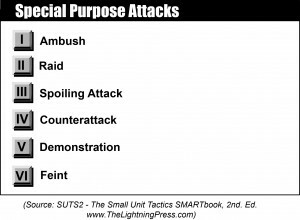 Special purpose attacks are ambush, spoiling attack, counterattack, raid, feint, and demonstration. Special purpose attacks are ambush, spoiling attack, counterattack, raid, feint, and demonstration. The commander’s intent and the factors of METT-TC determine which of these forms of attack are employed. He can conduct each of these forms of attack, except for a raid, as either a hasty or a deliberate operation. An ambush is a form of attack by fire or other destructive means from concealed positions on a moving or temporarily halted enemy. It may include an assault to close with and destroy the engaged enemy force. In an ambush, ground objectives do not have to be seized and held. Note: See related article for further discussion on the ambush. A raid is a form of attack, usually small scale, involving a swift entry into hostile territory to secure information, confuse the enemy, or destroy installations. It ends with a planned withdrawal from the objective area on mission completion. A raid can also be used to support operations designed to rescue and recover individuals and equipment in danger of capture. Note: See related article for further discussion on the raid. A spoiling attack is a form of attack that preempts or seriously impairs an enemy attack while the enemy is in the process of planning or preparing to attack. The objective of a spoiling attack is to disrupt the enemy’s offensive capabilities and timelines while destroying his personnel and equipment, not to secure terrain and other physical objectives. A commander conducts a spoiling attack whenever possible during friendly defensive operations to strike the enemy while he is in assembly areas or attack positions preparing for his own offensive operation or is temporarily stopped. It usually employs heavy, attack helicopter, or fire support elements to attack enemy assembly positions in front of the friendly commander’s main line of resistance or battle positions. A counterattack is a form of attack by part or all of a defending force against an enemy attacking force, with the general objective of denying the enemy his goal in attacking. The commander directs a counterattack—normally conducted from a defensive posture—to defeat or destroy enemy forces, exploit an enemy weakness, such as an exposed flank, or to regain control of terrain and facilities after an enemy success. A unit conducts a counterattack to seize the initiative from the enemy through offensive action. A counterattacking force maneuvers to isolate and destroy a designated enemy force. It can attack by fire into an engagement area to defeat or destroy an enemy force, restore the original position, or block an enemy penetration. Once launched, the counterattack normally becomes a decisive operation for the commander conducting the counterattack. A demonstration is a form of attack designed to deceive the enemy as to the location or time of the decisive operation by a display of force. Forces conducting a demonstration do not seek contact with the enemy. A feint is a form of attack used to deceive the enemy as to the location or time of the actual decisive operation. Forces conducting a feint seek direct fire contact with the enemy but avoid decisive engagement . A commander uses them in conjunction with other military deception activities. They generally attempt to deceive the enemy and induce him to move reserves and shift his fire support to locations where they cannot immediately impact the friendly decisive operation or take other actions not conducive to the enemy’s best interests during the defense. The principal difference between these forms of attack is that in a feint the commander assigns the force an objective limited in size, scope, or some other measure. Forces conducting a feint make direct fire contact with the enemy but avoid decisive engagement. Forces conducting a demonstration do not seek contact with the enemy. The planning, preparing, and executing considerations for demonstrations and feints are the same as for the other forms of attack.